OTT and TV Everywhere service providers can now benefit from state-of-the-art service assurance in their multi-screen deployments. Amsterdam, September 14th, 2017 – Agama Technologies, the specialist in video service quality and customer experience, and VisualOn Inc., a multimedia software company that enables scalable, cross-platform media playback for global streaming media brands, announced today that they are partnering to deliver a pre-integrated player SDK solution for efficient video service quality assurance for Over-The-Top (OTT) providers. The pre-integration of Agama’s industry-leading video service assurance solution with VisualOn’s cross platform, multimedia framework provides real-time 24/7 monitoring, assurance and analytics technology into VisualOn-powered devices. This integration simplifies the process for operators wanting to ensure a high-quality viewing experience of OTT media content on a wide variety of connected devices, anytime and anywhere. 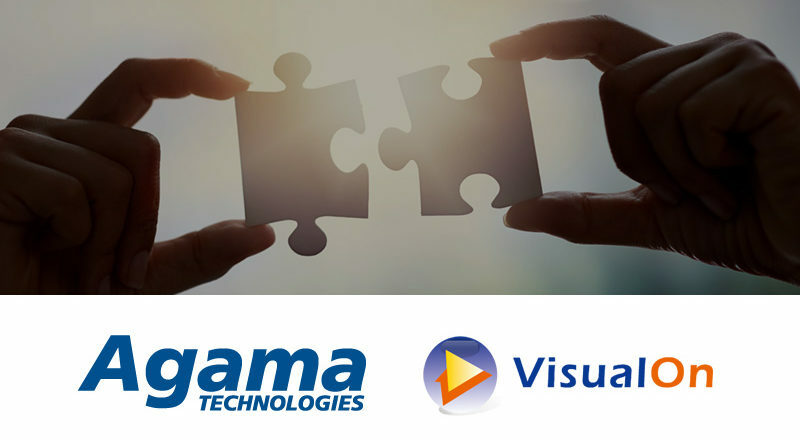 “We are delighted to be partnering with a leading vendor such as VisualOn to enable a pre-integration with our solution,” says Mikael Dahlgren, CEO of Agama Technologies. “In today’s fast-moving OTT environment, it is important to maintain efficiency when rolling out new services by shortening the integration time and minimising the risk within projects”. Agama’s OTT Service Assurance solution enables operators to gain essential insights into the actual performance of their video services. The solution provides both an aggregated overview and fine-grained details about each and every device, in the home or on the go. The Agama solution has a proven scalability of many millions of devices and supports operators in understanding the quality of experience of millions of end users. The solution supports technical operations, service management and development, as well as customer care and media consumption analytics. VisualOn’s OnStream® MediaPlayer+ (OSMP+) is a multimedia player development kit, enabling cross-platform content delivery and playback on connected devices, including mobile handsets, tablets, desktops, laptops, set-top boxes and smart TVs. OSMP+ enables the development of both enterprise and consumer-grade applications to meet the latest trends in high-quality audio-video streaming. It allows seamless playback across multiple hardware architecture and platforms, and incorporates the most advanced video and audio decoding technologies to support many industry standard formats, including HEVC (H.265), H.264, AAC and many others. It also supports most adaptive streaming protocols and closed captioning/subtitle formats. VisualOn’s analytics and AdFlow solutions extend and enable QOS, Monetization, and tracking. Both Agama and VisualOn will be exhibiting at IBC2017, where they will showcase their latest products and solutions. You can visit Agama at stand #5.B72 and VisualOn at stand #14.G11-15. Agama Technologies specialises in empowering video operators’ business processes with awareness that can drastically lower operational costs and improve customer satisfaction. With extensive experience and an industry-leading solution for monitoring, assurance and analytics of video service quality and customer experience, Agama helps operators to implement a data-driven way of working to assure optimal service quality, improve operational efficiency and increase customer understanding. The company is based in Linköping, Sweden, and is privately held. VisualOn, Inc. is a Silicon Valley-based, multimedia software company that enables rich entertainment experiences across smartphones, tablets, laptops, desktops, streaming devices, set-top boxes and other connected devices. VisualOn’s unique patented technology is designed to be platform independent for ease of integration, with optimized quality, performance, and minimal power consumption. VisualOn supports streaming, VOD, mobile TV and other multimedia applications with superior quality levels that enable content providers to reach their target audience. VisualOn’s OnStream MediaPlayer+ enables content providers to get their services to market quicker in a scalable manner and overcome device and service fragmentation. The product also provides features and functionality to support content security via third part DRM integration, built-in player analytics, tracking and AD enablement.